Note that Susan was the sister of Rhoda Rogers who married Grover's brother Van. Hanshaw, Grover, head-of-household, age 26, born in West Virginia; parents born in West Virginia; rented home; occupation: laborer, farm. Hanshaw, Susan, wife, age 23, born in West Virginia; parents born in West Virginia; occupation: laborer, farm. Hanshaw, Delta, daughter, age 6, born in West Virginia; parents born in West Virginia. Hanshaw, Lester R., son, age 5, born in West Virginia; parents born in West Virginia. Hanshaw, Senith [unclear] A., daughter, age 1 year ? months, born in West Virginia; parents born in West Virginia. 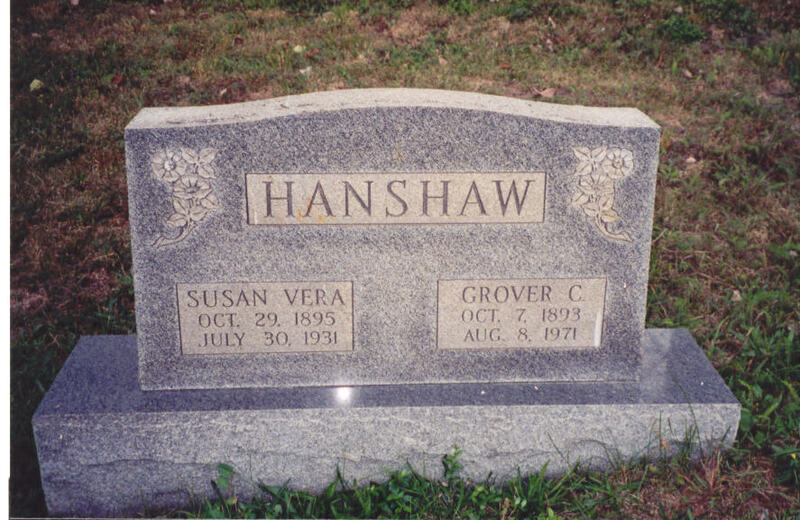 Hanshaw, Grover, head-of-household, age 36, born in West Virginia; parents born in West Virginia; first married at age 19; rented home ($10 rent); no radio in home; occupation: laborer, C.C. Klip[..unclear..]; not a veteran. Hanshaw, Susan, wife, age 34, born in West Virginia; parents born in West Virginia; first married at age 17. Hanshaw, Delta, daughter, age 17, born in West Virginia; parents born in West Virginia; attended school. Hanshaw, Lester, son, age 15, born in West Virginia; parents born in West Virginia; attended school. Hanshaw, Alice, daughter, age 11, born in West Virginia; parents born in West Virginia; attended school. Hanshaw, Ruby, daughter, age 6, born in West Virginia; parents born in West Virginia; attended school. 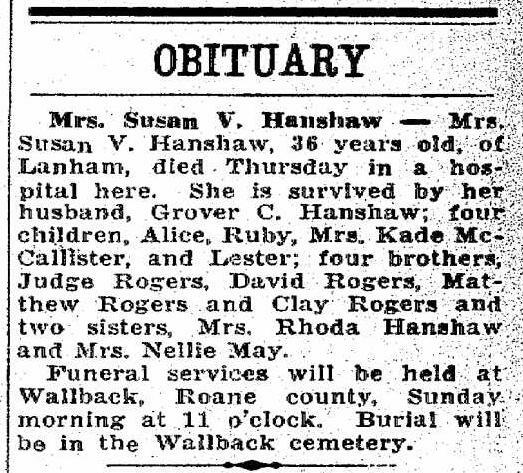 Susan's obituary was published in the "Charleston Daily Mail" (Charleston, West Virginia) on Saturday evening, August 1, 193119 (see scan below). Riggs, Ida, head-of-household, age 60, born in West Virginia; completed 3rd grade; on Apr 1 1935 was living in the same place/town; widow; owned home ($100 value). Hanshaw, Grover, lodger, age 50, born in West Virginia; completed 6th grade; on Apr 1 1935 was living in the same place/town; widower; occupation: carpenter, building; worked 4 weeks in 1939; $48 wages in 1939. 1920 census, Clay County, West Virginia; roll T625-1949, ED 28, page 13A, line #14, dwelling #212, family #214. 1930 census, Spring Hill, Jefferson Township, Kanawha County, West Virginia; roll T626-2538, ED 67, page 15A, line #1, dwelling #349, family #349. Contribution from Ellen Jones (). Contribution from Melissa Kay Hanshaw McLain. 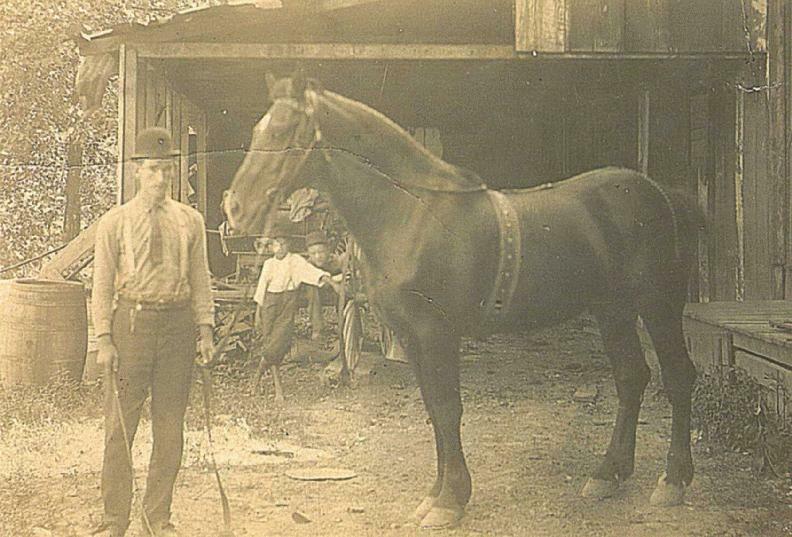 "Hacker's Creek Pioneer Descendants", "Don Norman Family Files": http://www.rootsweb.com/~hcpd/norman/HANSHAW. 1900 census, Henry District, Clay County, West Virginia; roll T623-1757, ED 7, page 18B, line #83, dwelling #315, family #336. 1910 census, Henry District, Clay County, West Virginia; roll T624-1678, ED 2, page 289A, line #38, dwelling #232, family #236. West Virginia, Marriages Index, 1785-1971; http://www.ancestry.com. "Charleston Daily Mail", Aug 1 1932; http://www.ancestry.com. 1940 census, Spring Hill, Jefferson District, Kanawha County, West Virginia; roll T627-4415, ED 20-95, page 11A, line #12, household #187. Photo courtesy of Ellen Jones () and (private) Hanshaw.